Clever Guerlain. Having realised that many of us are reluctant to splash out on expensive skin fixes – no matter how highly-rated – without being sure we’ll love using them, they’ve come up with a brilliant way for us to road-test some of their beauty icons without upsetting the budget. 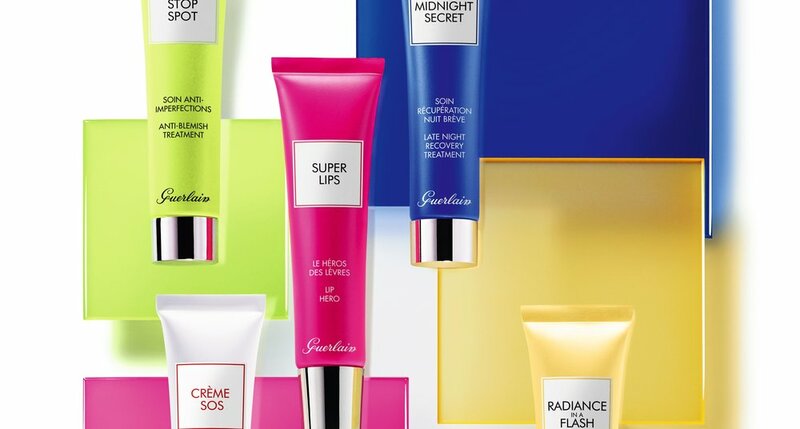 Each of the My Super Tips products is priced £20, with five products in the range – existing ‘heroes’, reworked with improved textures and/or fragrances (and in some cases, a catchier name). Crème SOS– a brilliant soother for tight, dry, red and sensitive skin of all types, cooling and calming. (And now with a soft scent that reflects that.) Superlips– if, like us, having the central heating on for w-a-y longer than you’d have liked has made your lips crispy, this is gloriously replenishing, now with a sweet bergamot/candy fragrance. Stop Spot– formerly known as ‘Crème Camphréa’, but who the heck knows what that means? This is a much better description for a product that stops spots in their tracks, with its camphor-y blend, while subtly concealing. Radiance in a Flash– which does just what it says: a gel-textured product which somehow delivers instant energy to skin, now with a lovely citrus-amber scent. Even better: though you wouldn’t carry some of the hefty jars or bottles these used to come in around in your handbag, these are all lightweightand packable for skin SOS-es, anywhere, anytime.